Dr. G. and Laserfit Vision are putting keratoconus in their sights, using revolutionary and patented Laserfit Lens process with wavefront-guided optics. So far the results have been nothing short of amazing. A large majority of keratoconus patients are still totally reliant upon contact lenses. While some experience relatively good vision and comfort with their lenses, many suffer with discomfort, sub-optimal visual acuity, and severe visual distortions such as glare, halos, starbursts, and shadow images – even with RGP lenses and sclerals. Why is this? For years Laserfit Vision has studied the degradation of vision after LASIK, PRK, RK, PKP, and now keratoconus. This has led to the study of complex refracting surfaces. Keratoconus presents one of the most complex surfaces of an eye, where shapes and curves change abruptly. This leads to highly undesirable image patterns, called aberrations. These aberrations can be measured with a wavefront aberrometer. In fact, the aberrometer can actually tell us what the patient sees. Each and every eye has a unique optical fingerprint, or wavefront. The Laserfit process creates a complex contact lens surface which has the properties of countering the optical aberrations of the keratoconus cornea. A number of different algorithms and techniques for introducing complex surface deformations in the lens are used during the design process. These surfaces are matched to the unique wavefront of each eye, and are therefore called wavefront-guided. The goal is to turn a distorted wavefront into a more perfect wavefront. Recently, some researchers have published their findings with respect to wavefront-guided scleral lenses and keratoconus (see Sabesan et. al., and Marsack et. al.) At the time these articles were published, Dr. G. had been using this technology for a number of years. The complicated optics need to be precisely positioned on the eye. Therefore the lens needs to maintain a precise position and not rotate. The patented asymmetric, non-rotational Laserfit scleral lens is the ideal vehicle for this. Because the lens is designed from scans of the eye using an accurate FDA-approved OCT device, its shape follows the natural contours of the eye. This “hand in glove” relationship not only keeps the lens stable on the eye, but also enhances the comfort. Our most recent case this week was a young gentleman from the UK who recently graduated from university. He developed keratoconus after having had LASIK in 2007. One eye was worse than the other, and he wore a 16.5 mm mini-scleral lens for irregular corneas that was fitted in the U.K. He also underwent corneal cross-linking. With best vision of 20/30 with glasses, and not much better with the contact lens, he still suffered from insufferable glare and doubling of images. Within just a few days a pair of Laserfit Lenses were produced that gave him 20/15 in each eye, with no bleeding or doubling of images, and with great all day comfort. Dr. G. and Laserfit Vision are continually investing in new technology. 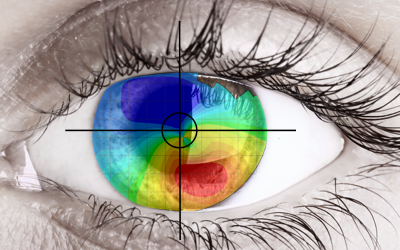 We recently acquired software that enables us to more precisely model a keratoconus cornea. The goal is that by gaining a better understanding of the dynamics which determine the shape of the cornea, better lens corrections can be developed for those whose results are still less than ideal.